Takako Arai was born in 1966 in Kiryu City, Gunma Prefecture to a family engaged in textile manufacturing, a traditional industry in the region. 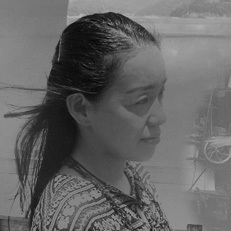 Her first collection of poetry, Hao-bekki, was published in 1997. Her second collection, Tamashii dansu, was published in 2007 and awarded the 41st Oguma Hideo Prize. Several of the works from that collection have been translated in Soul Dance: Poems by Takako Arai (Mi’Te Press, 2008). Since 1998 she has been a regular contributor to, and eventually editor of Mi’Te, a magazine featuring poetry and criticism. She lives in Tokyo and teaches Japanese to international students at Saitama University. Jeffrey Angles is an associate professor of Japanese literature at Western Michigan University. His translations have won the Japan-U.S. Friendship Commission Prize for the Translation of Japanese Literature, as well as grants from the PEN Translation Fund and the National Endowment for the Arts. Among his translations are several collections of poetry, including Soul Dance: Poems by Takako Arai (Mi’Te Press, 2008), Killing Kanoko: Selected Poems of Hiromi Ito (Action Books, 2009), and Forest of Eyes: Selected Poems of Tada Chimako (University of California Press, 2010). He also writes his own poetry in Japanese.